You must be able to pass an Army flight physical if you are a pilot, non-rated air crewmember, or an air traffic controller. If you have a disqualifying medical condition, you won't be able to fly for the Army. The restrictions are set out in Army Regulation 40–501 Medical Services Standards of Medical Fitness. The regulation covers who must pass a flying duty medical exam (FDME), who can perform the exams, and the medical fitness standards in detail. The medical fitness standards and requirements for flight physicals apply not only to Army personnel but also to civilian contractors and air traffic controllers. These are defined in four classes. Class 1: Warrant officer candidate, commissioned officer or cadet. Applies to applicants for aviator training, applicants for special flight training programs and non-U.S. Army personnel selected for training at aircraft controls. Class 2: Student aviators after beginning training, rated Army aviators, DAC pilots, contractor pilots (unless they have an FAA Class 2 Medical Certificate), Army aviators returning to aviation service, other non-U.S. Army personnel. Class 2F/2P: Flight surgeons, APAs, AMNPs, those applying for or enrolled in the Army Flight Surgeon Primary Course. 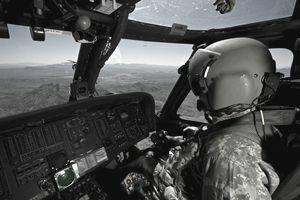 Class 3: Non-rated crewmembers, nonrated medical personnel selected for aeromedical training, soldiers and civilians who participate in regular flights in Army aircraft but who do not operate aircraft flight controls, Army civilian contractor non-rated crewmembers who do not have an FAA Class 3 Medical Certificate or DD Form 2992. Class 4: Military air traffic controllers (ATC), civilian ATCs who are required to meet Class IV OPM standards. The exams are performed by U.S. military or civilian flight surgeons, aeromedical physician assistants (APA), aviation medicine nurse practitioners (AMNP), or aviation medical examiners (AME). If no aeromedical trained staff is available, the exam can be reviewed and signed by a flight surgeon. DD Forms 2808, DD Form 2807-1 or DA Form 4497 are required. The full requirements are laid out in Chapter 6 of Army Regulation 40-501. A comprehensive flying duty medical exam is done every five years up to age 50 for personnel in classes 2/2F/3/4. After age 50, it is required annually. They are also completed after any Class A and B mishap. An Interim FDME is performed in the years that the comprehensive FDME isn't required. Chapter 2 of Army Regulation 40-501 lists the physical standards for enlistment, appointment or induction. It covers many conditions that would exclude military service. These standards also apply to serving personnel who may develop conditions after enlistment. Chapter 4 of Army Regulation 40-501 lists the conditions and physical defects that can lead to rejection in selection, training, and retention of Army aviators and contract pilots, flight surgeons and other aeromedical team members, air traffic controllers, nonrated aircrew and unmanned aerial systems operators. The standards for fitness for flying duty may be even more restrictive than these general military medical standards. Check here, then check the specific standards for your class.